Run by a bunch of ukulele-loving homeschooled kids on our way to the next Kahumoku Ohana Music and Lifestyle Ukulele and Slack-key workshop. Our goal with this site is to provide ukulele info, while at the same time earning money to pay our way to the workshop(s). 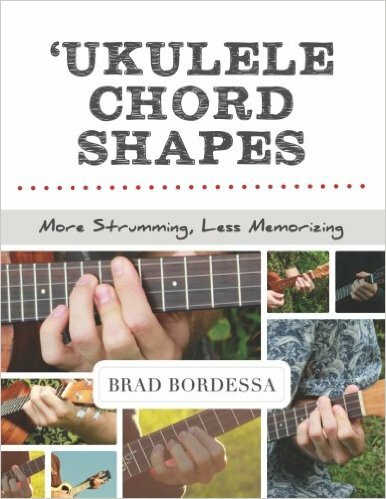 Brad Bordessa now offers ukulele lessons via Skype from where he lives in Hawaii. Whether you are a beginning player looking for your first guide to understanding the fretboard or a seasoned pro in need of a complete reference to complex harmonies, ‘Ukulele Chord Shapes is your one-stop resource. With in-depth and easy-to-understand explanations of chord theory and applications, this method can expand your chord vocabulary twelvefold. A beautiful and detailed library of chord shapes completes the guide, giving you the information you need to strum along with almost any song. Sisters Jenny Peters and Rebecca Bogart are both professional musicians with over 100 years experience teaching instruments from soprano ukulele to string bass. 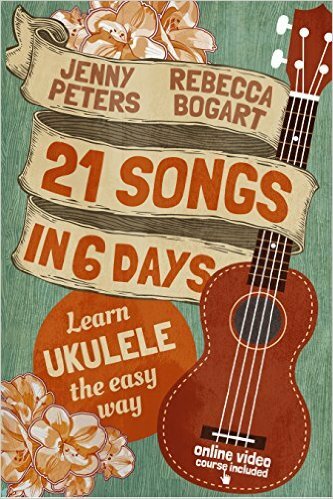 Jenny has taught hundreds of fourth graders ukulele using the methods in this book. If they can do it, so can you! *includes access to over 60 carefully sequenced lesson videos and audio accompaniment tracks. No annoying technical SNAFUS – you’ll get the lesson links delivered via email straight to your inbox. *incorporates tried and true principles of speed learning used by experienced musicians. You’ll be ready to tackle HUNDREDS of new songs when you finish the book.